TS Chief Minister’s Overseas Scholarships Online Application 2018 for Minority Students: TS Chief Minister’s Overseas Scholarships Online Application 2018 for Minority Students #Chief Minister’s Overseas Scholarship Scheme for Minorities, CMs Overseas Scholarships, TS Overseas Study Scheme, Telangana Overseas Study Scheme, TS Foreign Education Scheme, Scholarships for Foreign Studies, Financial Assistance for Foreign PG Courses and Doctoral Courses. Government of Telangana State, Minorities Welfare Department has given CM's Overseas Scholarships 2018 notification in August and Online Applications are invited from eligible candidates fro grant of Scholarship/ Financial Assistance for pursuing Post Graduate/ Doctoral Course in Foreign Universities for 2018-2019. 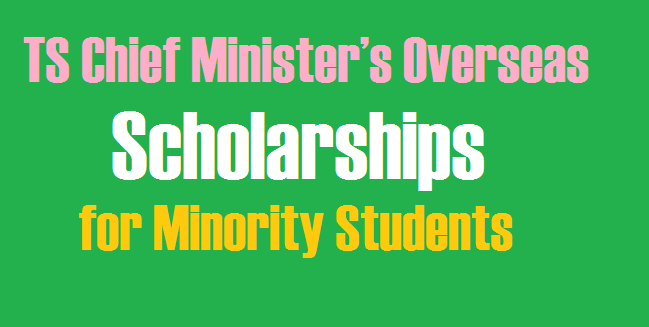 Chief Minister’s Overseas Scholarship Scheme: Government of Telangana State, Minorities Welfare Department introduced a new scheme of “Overseas Study Scheme for Minorities” for pursuing Higher Studies in Post Graduate Courses in Foreign Universities from the year 2018-18 and it is benefit to the students belonging to Minority Community. Minority Students Overseas Scholarships: Chief Minister's Overseas Scholarship Scheme for Minorities. CM Overseas Scholarship Scheme for Minorities. MW Students Overseas Vidya Nidhi Scheme scholarships. Minority Students Overseas Vidya Nidhi Scheme scholarships. Minority Students Overseas Study Scheme scholarships. Minority Students Ambedkar Foreign Study Scheme scholarships. Age Limit: The qualifying upper age limit for applicants for the scheme shall not exceed 35 years as on 1st July of the year. One-way ticket fare shall be paid to the selected candidates. (1) For Post Graduate Course: 60% marks or equivalent grade in foundation Degree in Engineering / Management / Pure Sciences / Agriculture Sciences / Medicine and Nursing / Social Sciences / Humanities. (2) For Ph.D. Courses: 60% marks or equivalent grade in P.G. course in Engineering / Management / Pure Sciences / Agriculture Sciences / Medicine / Social Sciences / Humanities. How to Apply: Desirous candidates can submit application online through the Website: www.telanganaepass.cgg.gov.in. Chief Minister's Overseas Scholarship Scheme for Minorities. Registrations for Chief Minister's Overseas Scholarship Scheme are open. Last date for Registration is ..........-2018. G.O.Ms.No.66. Dated:09.11.2018 - GOVERNMENT OF TELANGANA - SCHEDULED CASTE DEVELOPMENT (EDN) DEPARTMENT- SCDD- Education - Certain modifications in the existing financial Assistance Schemes such as “Ambedkar Overseas Vidya Nidhi Scheme for SC & ST Students/ Overseas Study Scheme for MW Students /Mahatma Jyothiba Phule BC Overseas Vidya Nidhi Schemes for BC Students” for pursuing higher studies in foreign countries - Modified Orders - Issued. 2. In the reference 7th read above, the Minority Welfare Dept., have informed that a meeting was held on 19.07.2018 under the Chairmanship of Advisor to Government, Minorities Welfare with the Spl.CS/ Prl.Secy/Secretaries of Welfare departments including concern HODs.Wherein certain changes have been proposed to extend the benefit in large scale under the above said schemes. 7 MandatoryRequirements 10% of overseas scholarships are reserved for Humanities, Economics, Accounts, Arts and Law students.